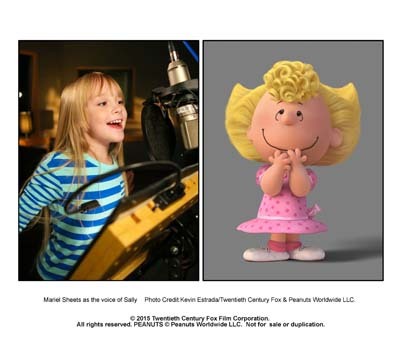 The kite-eating tree, the Doctor is In, the Sopwith camel, the Great Pumpkin, the sound of droning trombones as dialogue, and “You Blockhead!”; if you recognise any of these references, chances are you grew up as a Peanuts kid. 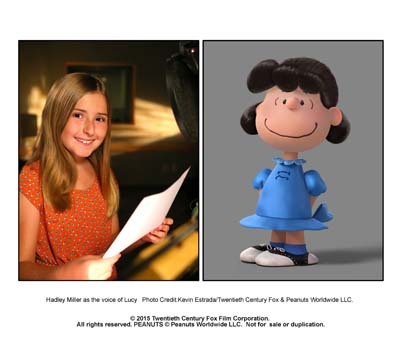 The characters that sprang forth from the pen of Charles M. Schulz to grace daily newspapers in syndicated strips and into TV sets for annual holiday excursions have been beloved around the world since 1950. 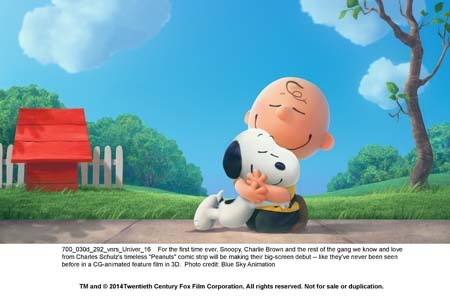 The Peanuts Movie is not the first Peanuts feature film, but it is the first to occur after Schulz’s passing in 2000, and the first rendered through computer animation. 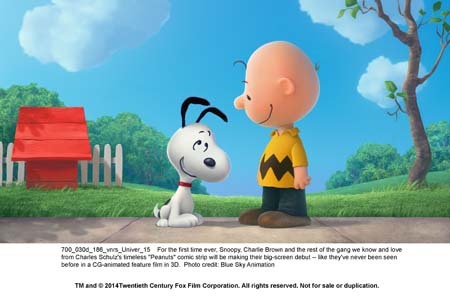 How would the homespun, wholesome simplicity of Charlie Brown, his childhood pals, and loyal beagle, Snoopy, hold up in this era of attention-deficit and kids who’ve grown up way too savvy thanks to the internet and social media? 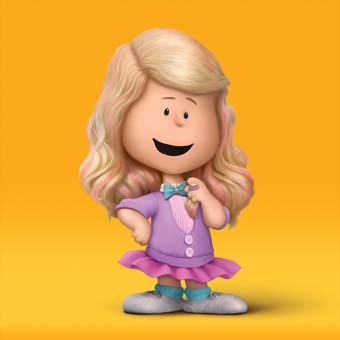 Charlie Brown is a kindly, good natured milquetoast; respectable but unnoticed, sort of just there, like furniture or a comfortable old shoe. There’s nothing exciting about him or his everyday life, so the advent of a new neighbour shakes things up a little. The introduction of a flame-haired siren into Charlie’s schoolroom turns his world upside down. While the boy is beyond smitten, he cannot even raise the gumption to cross the street and return a purloined pink pencil belonging to his new inamorata. Wishing to impress her, Charlie trains to become a master magician and a dancing king in his attempt to gain her attention, but all his efforts fall sadly short. Will anything make the Little Red-Haired Girl notice him? 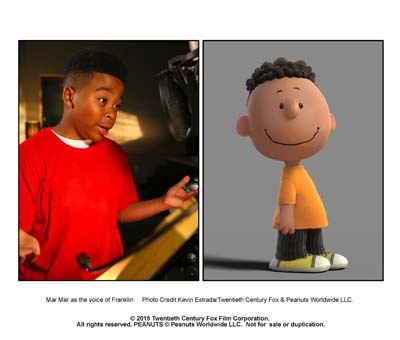 Everyone either knows or is a Charlie Brown. 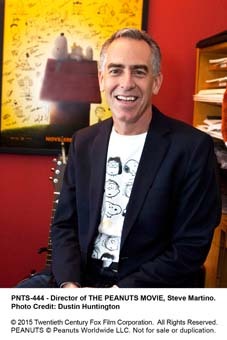 That one person who tries as hard as he or she can, but never quite has things turn out the way they plan. The follicularly-challenged kid with the big round head and graphically dramatic yellow shirt has been the first Everyman for children all over the world. 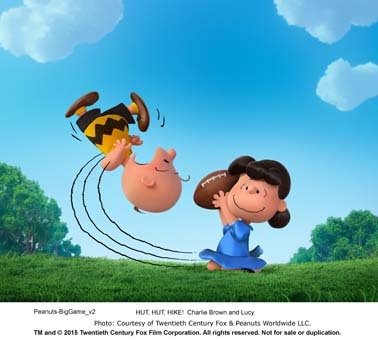 We have shaken our heads after generations of watching him continue to fall for Lucy’s sadistic football-kicking ploy. Wondered if there wasn’t something creepily supernatural about the kite-eating tree, and considered at what velocity a baseball has to be hit in order to actually knock the clothes off a pitcher on a mound? 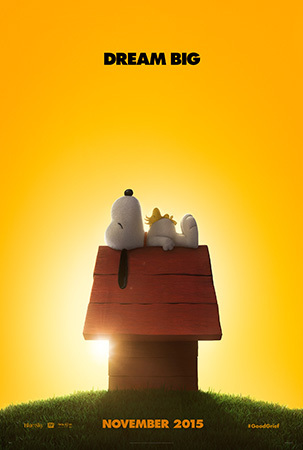 Who, after reading or watching Peanuts, didn’t wish they had a beagle, particularly one as excellent as Snoopy, who had an inner life and outer swagger more vibrant and exciting than Charlie Brown could ever dream of. The canine’s imaginary (?!) 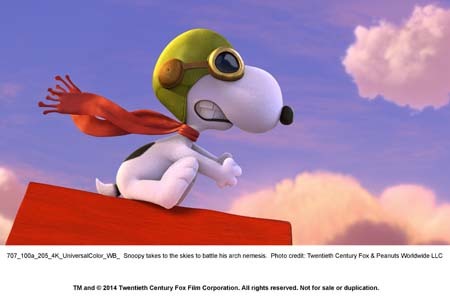 adventures as the World War I Flying Ace against his nemesis, The Red Baron, could be a movie of their own. 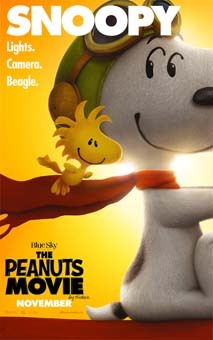 In fact, I found myself more on the edge of my seat for Snoopy and his fine feathered pal, Woodstock’s airborne thrills in this movie than all the action in the new James Bond film, Spectre. Keep it simple, stupid. 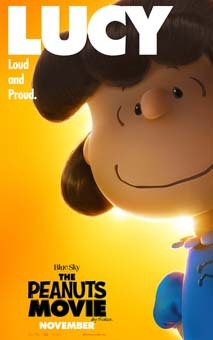 This is clearly the mantra the makers of The Peanuts Movie must’ve followed to create their loving, winning, big screen tribute to the works of cartoonist Schulz, and his world of Peanuts characters. 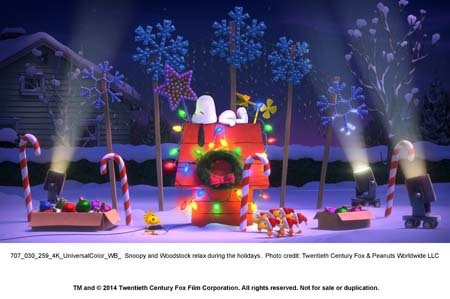 While embracing the high-end of 3D animation, the filmmakers go out of their way to balance that cutting-edge technology with the sweetly unpretentious, one-dimensional artwork that so many of us grew up with. 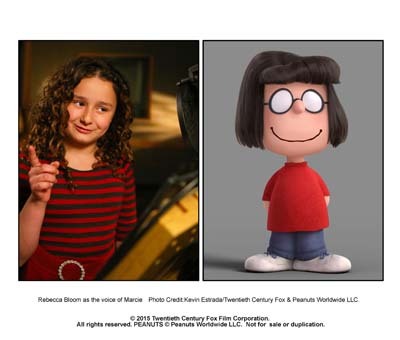 They mix the sharp, super-smooth CGI artwork of today (That brings an unexpected level of reality to things, like the texture of Lucy’s Bettie Page-ish curls) with flashbacks and thought bubbles that resemble Schulz’s hand-drawn, black and white newspaper strips, along with the unforgettable content of the classic holiday specials. This last aspect was significant because I’d have burned down the screen if they didn’t show at least one segment of the dance extravaganza from A Charlie Brown Christmas. Not only is it here, but there’s a few new way-out dances added in for good measure. There’s even a short scene during the Red Baron sequence that reminded me a bit of some of the psychedelics of the 1969 feature, A Boy Named Charlie Brown. It’s one of many moments where the 3D technology looks great. The other important facet the creators don’t lose sight of, is to include the heart in all things. 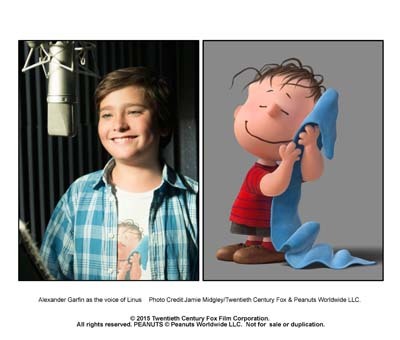 Though they may shake their heads at his blockheaded ways, Charlie Brown has got a devoted gang of pals around him, including the blanket-loving sage, Linus. 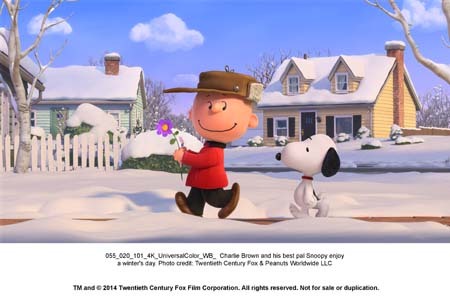 Most supportive, of course, is man – and boy’s – best friend, Charlie’s beloved beagle, Snoopy, who encourages his master in his every girl-winning endeavour; whether it’s ringing her doorbell and running, or helping train the boy toward terpsichoreal excellence. Even while trying to save the world from aerial oppressors, or writing the great American novel, Snoopy stays by Charlie Brown’s side. There’s also a lovely scene that reminds us that Charlie is also a doting brother to his wacky, Linus-obsessed little sister, Sally, when, in a moment of heartbreak, he defends her to his own detriment. 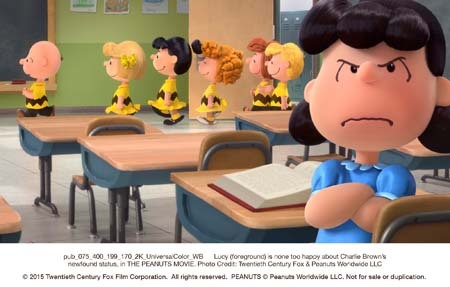 We also see a real test of our hero’s character when he is named the smartest kid in school and instantly lifted to rock star status, only to plummet again because even in the face of all his disappointments, Charlie Brown’s a standup guy. 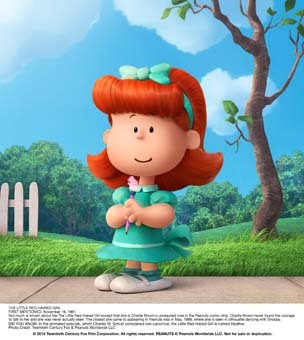 The writers remind the audience of this without saccharine or preaching in the same way Schulz was able to get across whatever homilies he intended with a light, but deft touch. 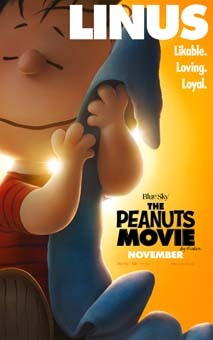 While The Peanuts Movie brings together different generations of fans and allows us all - regardless of our familiarity with the franchise - to enjoy the film, the writers definitely plumbed the gold mine of Peanuts references for moments that a devoted, lifelong fan like myself was delighted to be reminded of. 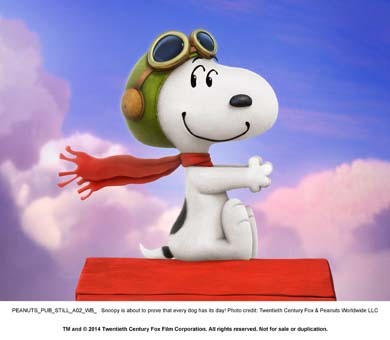 I think after years of seeing his current stint as the good-natured and utterly benign Met Life mascot, I’d lost sight of exactly how impish Snoopy was. He’s practically Charlie Brown’s id. The black and white beagle is a cutup; equal parts madcap, sharp as a tack, and cool as all get out. Witness his method of silencing the acid-tongued Lucy. See his dominance of a Soul Train line as aptly-named alter-ego Joe Cool. 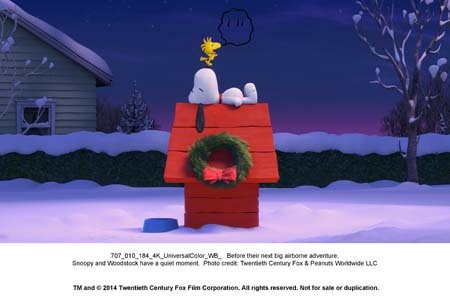 That humans around Snoopy can sometimes sense and strangely accept the world allegedly inside his head is almost like an alternate universe for the doggie and his little birdie pal, Woodstock, and adds a bit of cheery surrealism to the otherwise grounded Peanuts world. 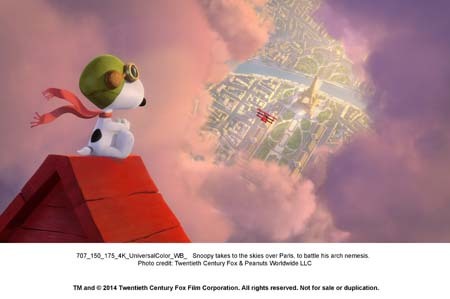 In this film, his battle against the Red Baron to gain the love of Fifi, an adorable female beagle aviatrix, parallels Charlie Brown’s ups and down in his struggle to win the Little Red-Haired Girl. 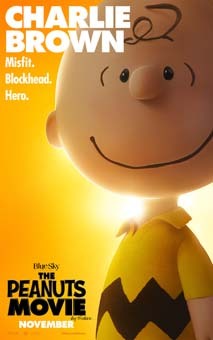 Clinging to Schulz’s simple, clean-cut life lessons and down-to-earth wit, as well as using the older specials and cartoons as a blueprint, The Peanuts Movie succeeds wildly in both bringing the charm of the characters to a new generation with a fresh and clever approach, while triggering fond memories for those who’ve grown up loving the world of Charlie Brown. 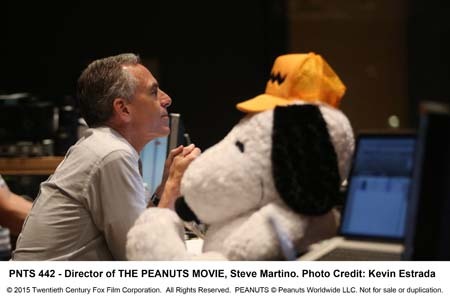 The creators of The Peanuts Movie adamantly refuse to fix what clearly was never broken and pay wonderful homage to the genius of Charles M. Schulz. 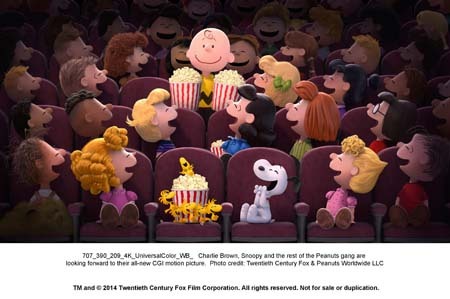 Packed with sweetness and lots of laughs, The Peanuts Movie is much more than just a nostalgia trip. 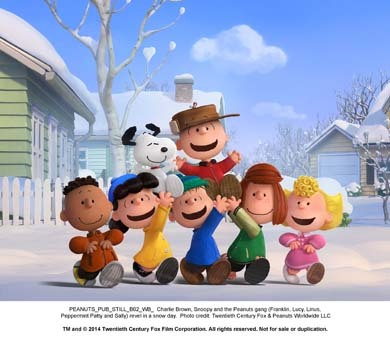 Yes, it reminds us why the characters Schulz created 65 years ago are still so beloved, but it is also so heartwarming, entertaining and innovative as to make us look forward to more big screen adventure with the Peanuts gang.